Aculon's glass repellency technology is designed to make glass surfaces hydrophobic, oleophobic, and repellent to nearly any liquid. Aculon's glass treatment is easy to apply, optically clear and ultra thin. It can even be applied via several application methods. 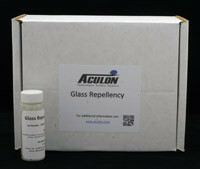 Fully immerse the part in the Aculon Glass Repellency Treatment solution for 30 seconds. Withdraw the part at a steady rate to ensure even coverage. Allow to dry or cure depending on your substrate. 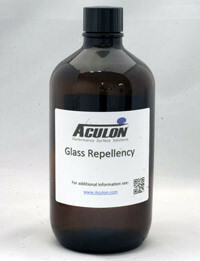 Aculon Glass Repellency Treatment comes in convenient 30 ml or 1L kits for dipping applications. Using a clean cloth apply Aculon Glass Repellency Treatment by wiping the treatment across the surface in a buffing motion for 1 minute per square foot. Spray the solution onto the substrate using double passes. Post-application curing is recommended for best performance. Spray Equipment Suggestions: HVLP (Binks Mach 1), HVLP (Devilbiss JGHV), Air Atomization (Devilbiss MBC gun) and Airless (Graco Model 225-292 President Pump Series A). Cure at room temperature with 40-50% relative humidity for ≥24 hours. The product may also be cured for shorter periods by increasing temperature up to 150°C. 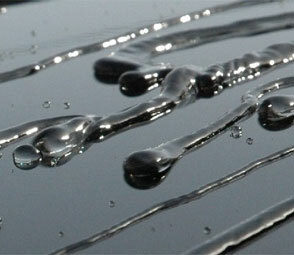 Higher temperature cures create coatings with increased durability. Choose cure temperatures and conditions based on your substrate and durability requirements.